What photographer and filmmaker Josh Gerritsen lacks in attachment to physical objects he makes up for in his penchant for creating. Josh and his family moved to Maine from Hawaii, where they purchased land—eight acres of pasture and 90 acres of forest, to be exact—in Lincolnville. 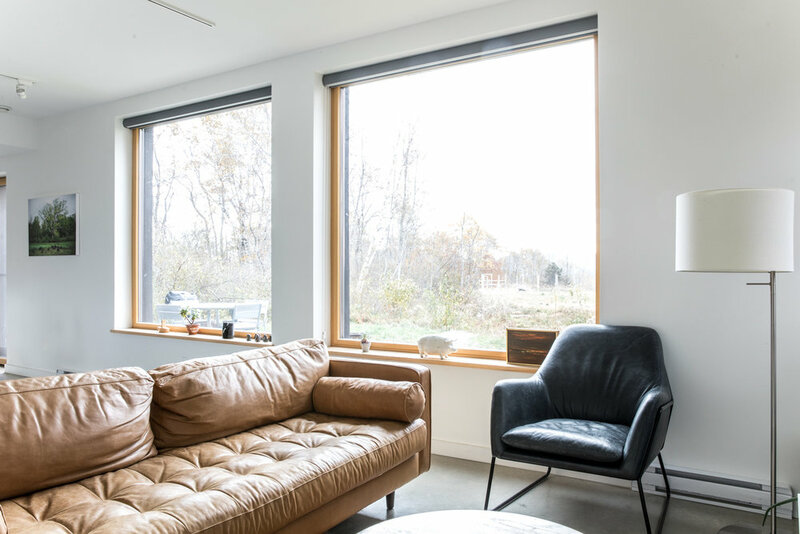 After living and working in New York City for several years, Josh decided to move back to the family farm in Maine where he eventually built an energy-efficient passive house with local design-build firm GO Logic. Josh lives there currently, while also renting out a room on Airbnb to curious guests who want to understand how a passive house works. He is also currently working on a documentary about pigs and the complicated relationship humans have had with them over the last 3,000 years. He is producing the film alongside his mother, the renowned author Tess Gerritsen. This isn’t the first time the duo have worked together; their horror film “Island Zero” was released last year. 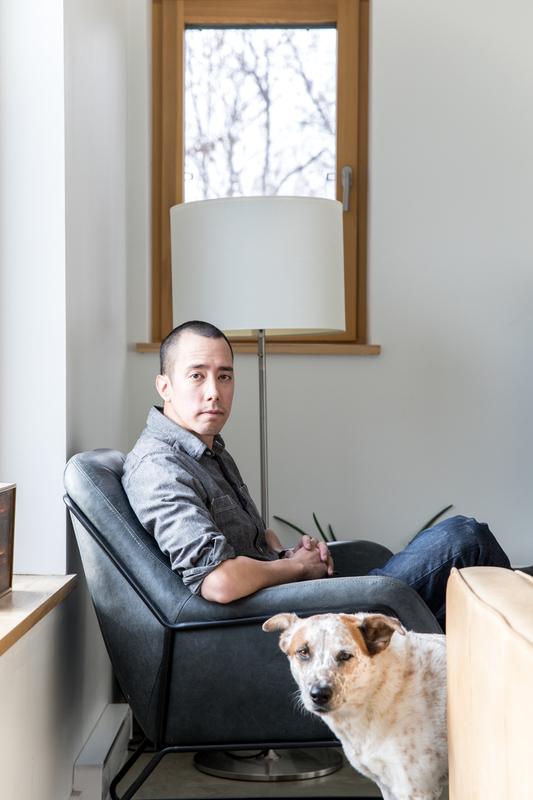 Here’s a glimpse inside Josh’s minimalist home and abundant life. THE MAINERS: I recognize the design of your house. Is it a GO Logic home? JOSH: Yes! 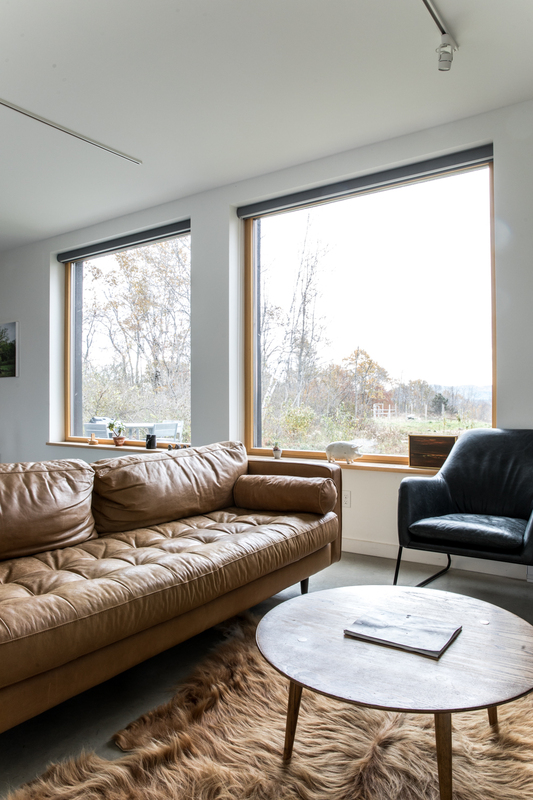 In 2011, before I moved back to Maine, my mom showed me a copy of a Maine Home+Design magazine that showcased GO Logic’s prototype Passive House. THE MAINERS: I remember that story well—I actually wrote it! Such a cool house. So efficient you can heat it with a hairdryer. JOSH: I toured it with my parents and my girlfriend at the time. I knew this was the house I wanted when I was ready. Fast-forward to 2013 and my former partner Marya had become friends with a woman named Irene whose partner, Gunther, is an architect for GO Logic. I was telling him about how I wanted to build a sustainable house, and so he became the architect on my project. It was such a great collaboration. We took one of the four-bedroom contemporary designs from the firm’s website and customized it without increasing cost. THE MAINERS: What are some of the ways you did that to make it your own? JOSH: We created some corner windows on the north façade in the bedroom and office. 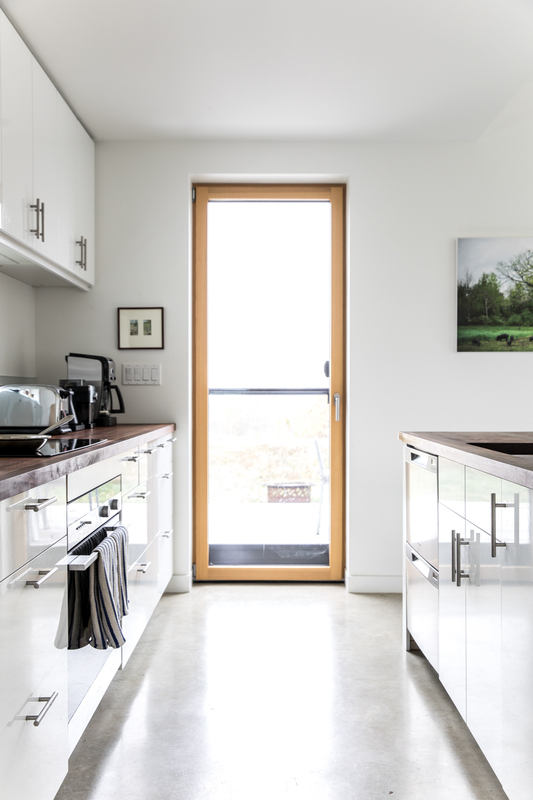 We added that long horizontal window in the kitchen. The burned wood siding, that was Gunther’s idea. In the original design there wasn’t a landing and the laundry room was right at the top of the stairs, but I wanted to have as many usable spaces as possible without increasing the square footage. As a way to get in more nooks and crannies, to the top of the stairs we added a spot for a desk and a window, and the laundry room became a small closet. The house sits twenty degrees off true south and I really like the way it’s set in to the property. It feels protected, and the view from the south façade is almost like you’re peeking through the forest to the mountains. THE MAINERS: I know minimalism is on trend right now, but I get the sense that you’re a true minimalist, like deep within your bones. JOSH: I would definitely call myself a minimalist. I find it is easier to think and reflect when you don’t have a lot of clutter. I am not a collector. When I’m done with a camera or a computer, I sell it immediately because I don’t feel the need to have multiple copies of something. I’m naturally an organized person, and when things are out of place, it bothers me. If I’m standing in line at the coffee shop and I see something is off on a shelf, I’ll rearrange it. I think it’s that kind of mentality that makes me a good photographer and filmmaker because I’m never happy with something until it’s absolutely perfect. I’ll edit a photo and come back a day later and tweak it. THE MAINERS: You say you’re not a collector, but that’s a lot of coffee makers for one person to own. JOSH: I rent out a room of the house on Airbnb so I like to have a variety of coffee options for people. The first one is a Chemex pour-over, a gift from Gunther. I don’t actually use it too often because it’s kind of labor-intensive. I got the Cuisinart because my producer insisted I get an automatic coffeemaker for all the meetings we were going to have. We needed something that would be easy for making coffee. And I have a French press because I know people love and trust their French presses. It honestly kind of hurts my head a little, but I have had people tell me that the coffee setup was one of the winning factors of my Airbnb. THE MAINERS: What’s it like to rent a bedroom to strangers while you live in the house? 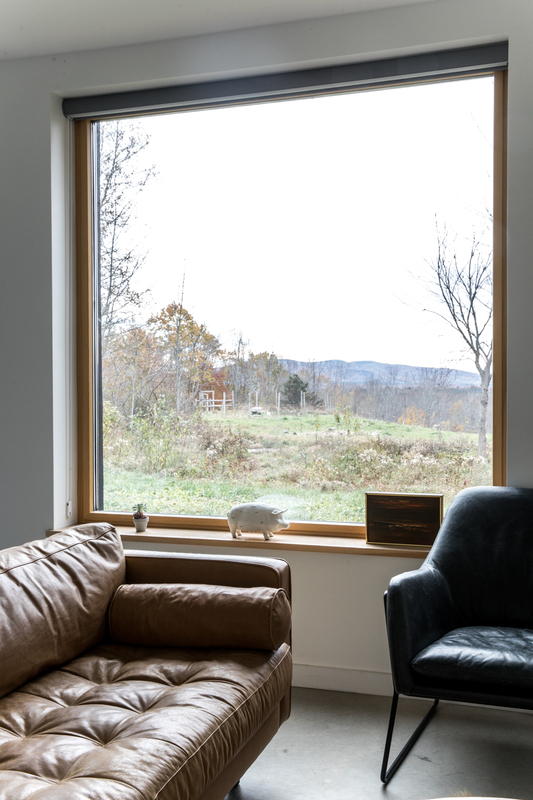 JOSH: Well, the house is something I wanted to share with people to show how a passive house works first hand. And it’s fun to meet people from around the world and hang out with them. I’m a very social person, an extrovert, so it’s a lot of fun for me to meet people. I didn’t realize how much enjoyment I’d get out of curating a really calming experience for people. Next year, I’m going to buy a 13-foot camper that you can tow with a 4-cylinder car. I’ve wanted to live in a tiny house for the last ten years and living in a house that could move was also something I’ve wanted to do for a long time. So starting next year, I’ll probably start renting out my entire house and take the camper and drive cross country. When I come home, I can park it 200 feet from the house in the field overlooking the mountains, build an outdoor shower and a graywater system and live in it for three seasons. I like the idea that while I’m Airbnb-ing my home, I can live in my tiny house. THE MAINERS: Are these all your own photographs on the walls? JOSH: Yes, and most of them are on canvas. 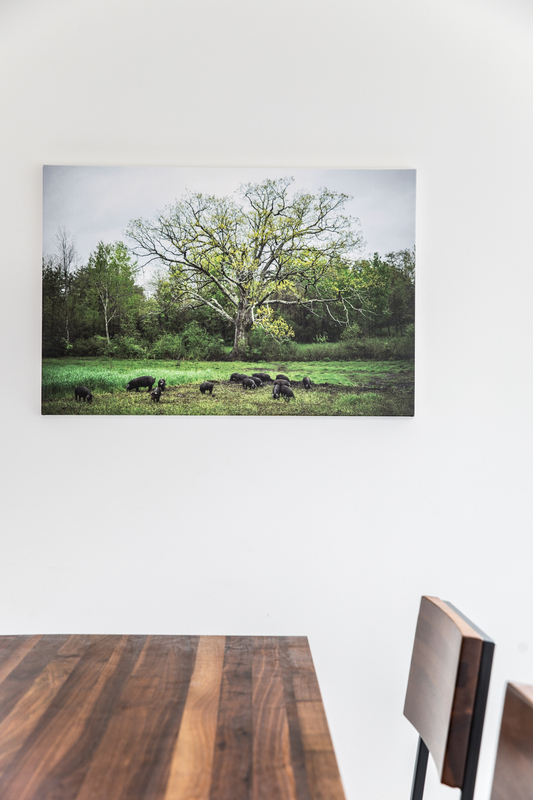 The photo of the pigs and the tree downstairs is one that I photographed at a farm I apprenticed at in Western Massachusetts for five months in 2012. I really like photographing subjects that are beautiful but have an ominous undertone, like a mystery around it. I don’t like photos that are so obvious, happy or sad, or clear cut. I think there’s a lot of beauty in the pigs and the foliage, but even the tree looks like it has a sinister side to it. The photo of the rock with the blue background downstairs is from my latest series of rocks in water. I stand in the ocean a little before sunrise with a neutral density filter with a one-minute exposure while the tide is coming in or out and photograph rocks. There are a lot of creative opportunities there. It’s very beautiful and you don’t know if you’re looking at a mountain or a rock or a creature. I don’t incorporate the horizon because that gives away the mystery of it. I got waders for Christmas from my parents, so now I can venture even farther out, even during winter. THE MAINERS: What are some of your prized possessions? JOSH: I don’t really attach sentimental value to many things. If something doesn’t have a utility, it bothers me that I still own it. My most prized possession would be my camera because of what it allows me to do. It’s a tool. The hand-painted wooden nesting dolls I commissioned a friend of mine to make. They’re by artist Hannah Kreitzer and they represent the central theme of the horror movie I made with my mom. My mom has a matching set. They basically represent the story of our film, which is that all of our problems in the world and in nature stem from man. ﻿THE MAINERS: How’d you get into photography and filmmaking? JOSH: It actually started in seventh grade—I was really into filmmaking. My first movie was called “Drugs, the Movie.” It was for Health class. I directed it and starred in it—I was a police officer and a doctor who got killed. I made a handful of little films here and there. I carried a camcorder around with me every day in eighth grade. I cut it all together and created a film from it and it’s something I cherish. I got into photography when I got my first digital camera senior year. When I went to Skidmore College, I told myself that going to school for filmmaking or photography wasn’t a serious pursuit and I needed to do something like a hard science, so I did environmental studies with a minor in political science, but still had that interest in photography. I spent most of my time doing photography and was actually hired by Skidmore’s college relations department to photograph for them. My passion and focus were on photography, which had nothing to do with my coursework, although I remain passionate about the environment and sustainability. After I graduated, I jumped right into doing photography professionally and moved to New York City where I lived on a sailboat. THE MAINERS: A sailboat? In New York City? JOSH: My best friend, Nate, told me he was going to live on his parents’ sailboat in New York, and that the rent would only be about $150 a month. So I lived there for six months with him on Liberty Landing in Jersey City. It was extraordinary. We had the best view in town because we weren’t technically in New York, but we got to look at it. It was a great introduction to the big city because I didn’t have to worry about immediately jumping into work. I could figure out what I wanted to do without that economic pressure. THE MAINERS: So from sailboat squatter to small-town selectman—how’d you get into politics? JOSH: I’ve always been interested in politics because of the potential to make people’s lives better. To me, it’s more interesting than sports because the outcome of elections actually have meaningful consequences. I never thought I’d be able to get into politics because I’ve had a stutter my whole life. I used to think about what I was about to say ahead of time and then deliberately choose words I had a lower probability of stuttering. But the side effect of doing that was that it made me sound less intelligent. When I got to Maine, it dawned on me that the stutter doesn’t define who I am. And oftentimes, the less you care, the less you stutter. So I joined the municipal Lincolnville Democratic party, and then I joined my county committee and went to the Maine Democratic Convention where I gave a speech on the floor advocating for early legalization of marijuana from a social justice standpoint, and the amendment overwhelmingly passed. It felt really good and very empowering that in a state like Maine, you can raise your hand, and say, “I think we should change this,” and suddenly it’s part of the party platform. So now I’m on the Lincolnville board of selectman and I serve on other committees in my town. And this is what I love about living in Maine: you can get involved politically and you can have an impact, without needing connections. You just have to have that passion. THE MAINERS: What’s a ritual that you have? JOSH: Most mornings I try to go to a coffee shop to get some work done. A lot of that is just to get out of my house. While I love my house and the seclusion, it can also feel very isolating. I can’t walk down the street and suddenly be in town. Even Lincolnville is not that rural. I turn left out of the road and I’m 12 minutes from Belfast and that’s certainly a way to have that reconnection with society. Even though I don’t really need coffee. But I’ll have a new ritual soon. THE MAINERS: The boat, you mean? JOSH: Yes, I’m building an Angus Rowboat from a kit. It’s a 16-foot plywood and fiberglass sliding-seat rowboat that can seat two adults comfortably, three in a pinch. It took me almost three months to build it. It’s a very stable craft with floatation chambers so self-rescue is possible. I wanted to row but I didn’t want to spend a lot of money buying a rowing shell that I could only use on a calm lake. I wanted something more versatile, something I could take out on the ocean and travel to islands with. The most complex thing I’ve ever built with my two hands was a chicken coop, so it was a very steep learning curve, but the instructions were great and there was a time-lapse video so I just figured it out. I made tons of little mistakes, but as long as the boat floats, I’ll be fine. It was a way to formally lean in to living in Maine. I don’t get any satisfaction in sitting in a park reading a book or sailing or downhill skiing because I feel like I’m not really accomplishing something. But rowing feels like serious exercise, like an adventure. When I travel, I always to have some sort of photographic goal, too. I can’t just go and hang out.